Individuals diving in the sanctuary must be aware of sanctuary regulations that protect historic resources and marine mammals. (iii) Installation of navigational aids. (4) Moving, removing or injuring, or attempting to move, remove or injure, a Sanctuary historical resource. This prohibition does not apply to moving, removing or injury resulting incidentally from traditional fishing operations. (7) Possessing within the Sanctuary (regardless of where taken, moved or removed from), except as necessary for valid law enforcement purposes, any historic resource, or any marine mammal, marine reptile or seabird taken in violation of the Marine Mammal Protection Act, Endangered Species Act or Migratory Bird Treaty Act. 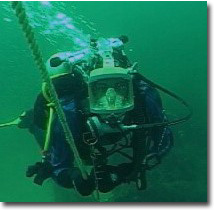 Under the above regulations divers are not permitted to grapple a shipwreck, drop a down line directly onto a shipwreck, or tie a down line onto any part of a shipwreck. Divers are also not allowed to leave an unattended mooring in the sanctuary at any time. Diving when in the vicinity of whales is considered harassment, and is punishable under federal law. Any boating activity that harms or causes a whale to change its behavior is also a violation of the Marine Mammal Protection Act and the Endangered Species Act.